The old joke goes like this: “95% of the world’s bourbon is made in Kentucky and the rest just isn’t bourbon.” It’s a cute line, sure, but it’s kind of dumb and not really funny anyway, except if you live in Kentucky or if your name is Jimmy Russell. I don’t know for sure if this percentage is still accurate, but even if it is, it is bound to decrease in this fun craft distilling world we find ourselves in, however slowly. The fact remains sure and true that the number of distilleries outside of Kentucky producing bourbon is long and ever increasing year to year (for a good list click here). This was bound to happen, because after all, bourbon can be made anywhere in America, not just in Kentucky. Eater.com published an article profiling 18 non-Kentucky bourbons that supposedly should be on your radar. I have tried a few of these, and while I am certainly not mortally insulted by any of them (Breckenridge and Few are pretty good), their prices are absurd, frankly. When faced with the choice of grabbing a $60.00 dollar bottle of 2 year old craft or purchasing a $24.00 dollar handle of 9 year old Buffalo Trace Kentucky Straight, then friend, I hope you understand how the free market works and are not flabbergasted when the vast majority of folks choose the latter, enjoy their fine Saturday night, and not give much of a flying ferret about the former. Bourbon is a 3 billion dollar industry in Kentucky. Production has increased 170% since 1999. 1.3 million barrels were filled in 2014 alone. As of 2014, 5.6 million barrels are aging in the Kentucky rack-houses. For perspective, 4.4 million people live in Kentucky. Kentucky sits on a huge bed of blue limestone. This limestone effectively filters the water source of unwanted hard iron and leaves in calcium and magnesium, aiding in fermentation and overall purity/taste. The climate offers huge temperature contrasts from summer to winter producing extraordinary aging activity. And plenty of farmland for corn, the base ingredient can’t hurt either. You want respect? You want to distill and sell your non-Kentucky bourbon? You are free to do so, just make sure you are putting quality in the bottle for a fair price and you’ll be well on your way, with me championing your efforts. Nose- Big oak sugars of toffee and butterscotch. Burnt caramel. Nice herbal feel, lavender? Musty rye. Nice. Taste- Oaky toffee, viscous and coating. Lovely. Toasted and dry. Finish- Medium to long. Big barrel char with musty feel to it. Herbal, blackberry and toffee. Great finish. Comment- Consistent, classic bourbon flavors. Gotta love it. I don’t think this bourbon will change my life forever, but I won’t prevent it from entering my glass either. Recommended. 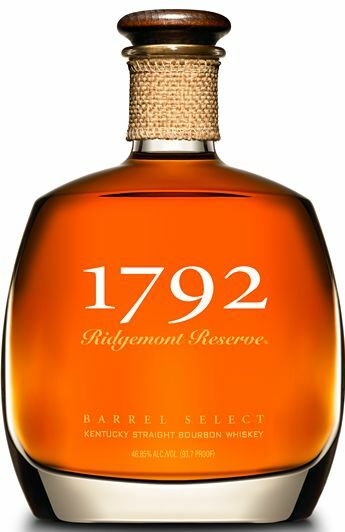 Footnote- Yes, 1792 was the year Kentucky entered statehood and Ridgemont is the official toasting whiskey of the Kentucky Bourbon Festival, but these facts were left out of the review because no one cares.